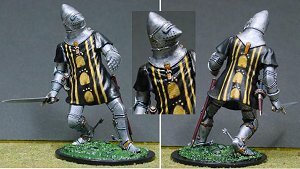 Most of the knights in my collection represent actual historical figures and display their authentic heraldry, but from time to time I commission pieces painted in the fictional arms of the Seven Kingdoms of Westeros. 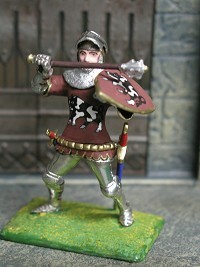 Here’s one, a Pegaso figure of a French knight, c. 1415… painted as a knight of House Beesbury, in the Reach. Gary Leitzell did the painting. This splendid version of Ser Brynden Tully was given to me by one of my Italian readers at the Lucca Comics and Game Show. 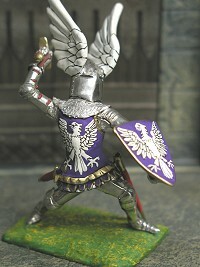 Converted from an Andrea kit of a Knight Hospitaller, c. 1250 A.D., the figure wears the personal arms of the Blackfish of Riverrun. Ser Brynden was assembled and painted by the talented Fabio Feltrin, a member of the Iron Throne Guild, who have an active web presence at http://xoomer.virgilio.it/lecronachedelghiaccioedelfuoco/home.htm. 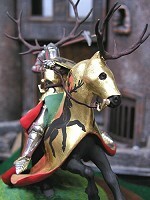 And here’s Robert Baratheon, the Lord of Storm’s End, as he rode into battle on the Trident with his great warhammer in hand. This is one of Brian Rodden’s magnificent 90mm figures, specially commissioned by my fair lady Parris as a Christmas gift, and inspired in part by Mike S. Miller’s dramatic lithograph of Lord Robert and Prince Rhaegar in their final confrontation. Brian Rodden is best known for his gorgeous 90mm figures, as above, but a few years ago he also started working in 54mm (the traditional “toy soldier scale”) and 50mm (which might be called “Courtenay scale”). Here are a couple of his dramatic 54mm figures, representing Lord Jason Mallister and Ser Lyle “Strongboar” Crakehall from A SONG OF ICE AND FIRE. These were a Christmas gift from some of the members of the Brotherhood Without Banners, the fan group that throws the fabulous Ice & Fire parties every year at Worldcon. I have to say, I have the best readers in the world. 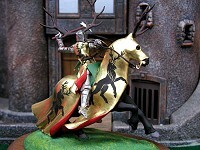 Early in 2005, I signed an agreement with the Testor Corporation of Rockford, Illinois to produce a wargame and a licensed range of pewter and resin miniatures based on the characters and world of Westeros A huge name in the hobby industry, best known for their line of enamels and their protective spray-on Dull Cote, Testor’s wanted to move beyond paints into the world of gaming, and announced ambitious plans for three different product lines based on A Song of Ice and Fire. The first of those was to be a range of fully painted resin collector’s figurines in the large 1/18th scale, to be sculpted, cast, and painted in China and sold in hobby shops worldwide. Testor’s hired a talented British artist named Jamie Sims to provide the conceptual drawings that the Chinese sculptors would work from. 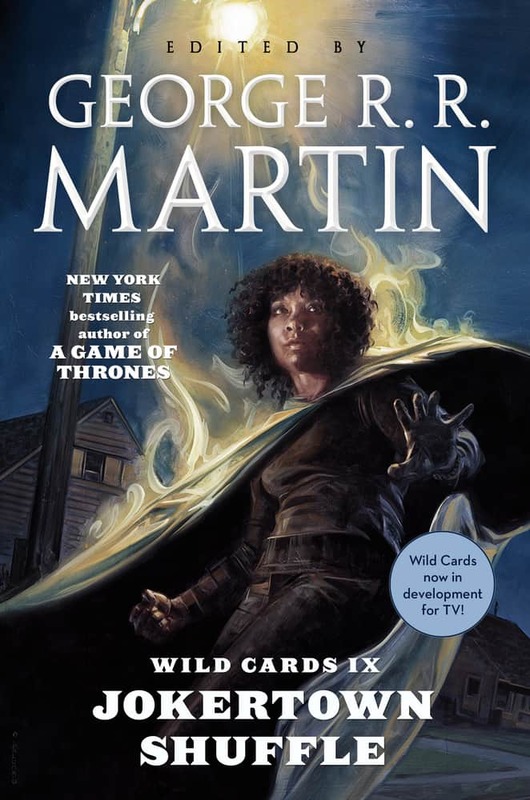 The initial batch of resins included figures of Lady Catelyn Stark, Lord Eddard with Ice, Sansa brushing Lady, Bran in his basket on Hodor’s back reaching down to pet Summer, Theon Greyjoy drawing his longbow, and and a mounted Robb Stark fighting off an attacker with Greywind beside him. Prototypes were sculpted, cast, and painted in China. Here’s a look. 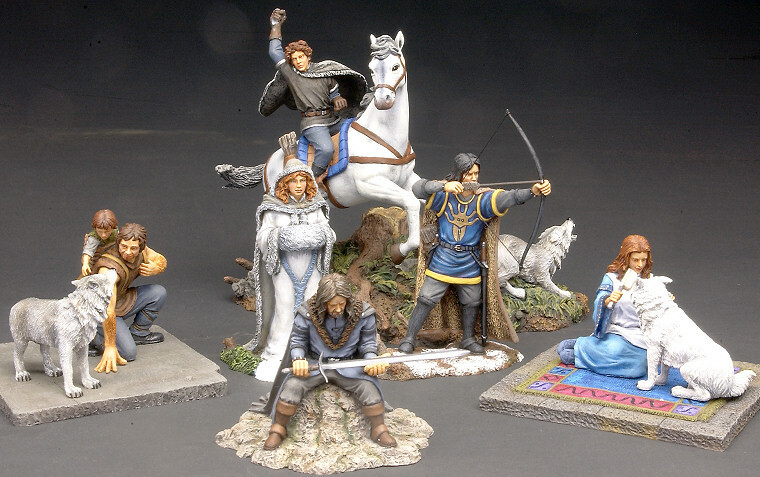 There were some problems with the color schemes (Theon should be in black, not blue, for instance), and I was never happy with the figures of Robb and Greywind. I approved all the others, however, and gave detailed notes on the correct color schemes for the painters. Initially the figurines were scheduled for release in the fall of 2005. That was pushed back to earLy 2006. Then it was decided that some of the other Testor’s Ice and Fire miniatures would roll out first. In the end, the resins were never released at all, and these prototypes, and a few later versions, remain the only ones ever cast. 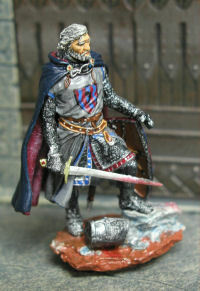 Dark Sword Miniatures acquired the license to make pewter miniatures based on A Song of Ice and Fire in May 2007, after the Testor’s license lapsed, and released its first wave of figures by November of that same year. Best known for its award-winning ranges of figures based on the fantasy artwork of Keith Parkinson and Larry Elmore, Dark Sword focused on exquisitely detailed minis in the popular 28mm – 32mm gaming scale. 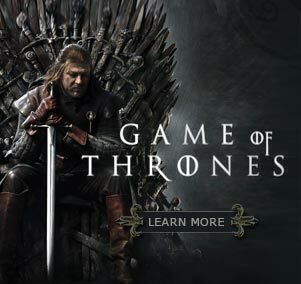 Their first “wave” featured six named characters (Jaime and Cersei Lannister, Melisandre of Asshai, Jon Snow, the Hound, and the Knight of Flowers), and four Sworn Brothers of the Night’s Watch, including a Raven Keeper. The sculpts were by the incomparable Tom Meier, who had also worked on the ill-fated Testor’s range.